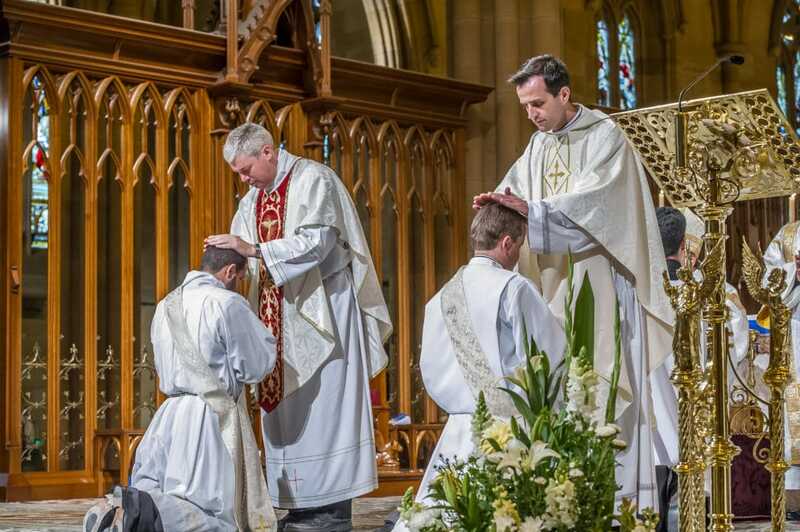 “We’re off and racing” may be unusual words to begin Sunday Mass, but they were appropriate as Fr Tom Stevens said his first Mass of Thanksgiving last weekend following ordination along with Fr Lewi Barakat the previous day. They reflected part of Fr Tom’s background, as his grandfather and father had been bookmakers and his dad had owned a pub, and the new priest has also enjoyed the excitement of the turf. But his opening line was a relaxed way of confirming a positive start to his priestly life. Unlike declining attendances for Sydney race meetings, St Patrick’s Church at Mortlake could have considered providing “standing room only” signs ahead of the Mass. Parish priest Mons John Usher invited children to sit on carpet at the front to assist with seating the overflow crowd, as locals arrived to show appreciation for the past year that Tom spent at Mortlake as a deacon and the numbers further increased through his many friends and relatives from the South Coast and from Moree in the north. Mons Usher was joined by fellow parish priests Fr Greg McGregor of Five Dock and Fr John Pearce CP of Marrickville and the rector of the Seminary of the Good Shepherd, Fr Danny Meagher, as concelebrants with Fr Tom. It’s been a pleasure having Tom as a deacon delivering incisive sermons often with touches of humour and enjoying his written contributions to the parish news bulletins, and we have known each other since meeting in 2010 at a friend’s funeral Mass. “He’s funny” was the loud comment of a young girl following laughter from the congregation during his opening words last weekend – and he is – but Fr Tom is predictably serious about his calling and spreading the word of Christ. Sunday’s Gospel from John 6:51-58 included the words “Anyone who eats this bread will live forever” provoking his reflections on how Christians have gathered for 2000 years to hear what he called “this revolutionary message”. One of his writings earlier this year put the Christian view against that of English actor, comedian, writer and atheist Stephen Fry who said God was “capricious, mean-minded, stupid and totally selfish” because bad things happened to good people. The then deacon’s reply was that Christians suffer just as God’s son suffered and died. He offered a reminder that while we don’t know why there is suffering, our faith ensures there is meaning coming from service to each other and through that growing in our relationship with Christ, who suffered the greatest injustice. Recently he wrote of surfer Julian Wilson who courageously went to the aid of teammate Mick Fanning who faced a possible shark attack. Tom suspected that the virtue of courage demonstrated by Wilson likely stemmed from charity and selflessness that he had already practised. In his first priestly sermon, Fr Tom spoke of having visited the tomb of St Mary MacKillop, noting that we are all Christian travellers with the spirit of Christ to be found through humility and service. Fr Tom’s father, Ron, ended Sunday’s Mass outlining his son’s earlier years; noting the sad loss of Tom’s mother aged only 60 in 1997; and stirring prolonged applause when ending with appreciation from the family and friends whose lives Tom has touched. He also thanked the former Archbishop of Sydney, George Cardinal Pell, and Mons Usher for their roles as father figures and mentors. Another line from Yeats is also appropriate as he considers those priests surrounding him for ordination and his first Mass along with so many people celebrating his first steps in a life fully committed to God: “Think where man’s glory most begins and ends, and say my glory was I had such friends”. Next articleIn what sense is Mary a queen? Mike Bailey has been a journalist for more than 45 years and is the executive officer to the vicar general and the chancellor of the archdiocese of Sydney.